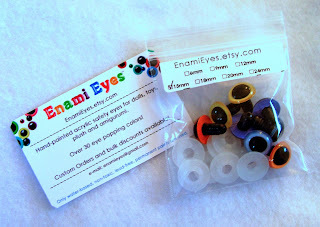 Enami EyesTM are hand-painted acrylic safety eyes for dolls, toys, plush and amigurumi. Only non-toxic, lead-free paints are used. The colors are permanent and will not transfer to fabric with normal use. Enami Eyes have a depth and richness that plastic store bought craft eyes just can't beat! Enami Eyes are available in more than 60+ amazing colors including: pastels, brights, shimmering metallics, glow in the dark fluorescents, and translucent colors that are not available in stores. Round pupil: 4.5mm /6mm /7.5mm / 9mm / 10.5mm / 12mm / 13.5mm / 15mm / 18mm / 21mm /24mm / 30mm / 40mm. Enami Eyes come with plastic or metal washers that snap into place, permanently affixing them to dolls and toys. They contain small parts therefore are not recommended for use by children under 3 years. Once Enami Eyes are affixed to dolls and toys, they can withstand machine washing in COOL/WARM water, detergent and NO BLEACH. I recommend placing washable toys with Enami Eyes in a pillow case to prevent the eyes from anything abrasive during the cycle. Drip dry or lay flat to dry, machine drying is NOT recommended. 100% secure payments via PayPal. You may use Visa, Mastercard, Discover, American Express, E-Check or Debit cards with Visa or Mastercard logos. Click here for ordering information.